Once people land on an About page, they want to know more about what a company does and what makes that business stand out from competitors. Coming up with the content for an About page might seem difficult at first, but it’s a lot easier if you include the crucial elements discussed below. Beautiful pictures go a long way in telling a story and making people want to know more about products, but you can create a story in a person’s mind with descriptive copy. If you’re crafting an About page for a company that sells nothing but disposable surgical gloves and masks, it’s hard to write interesting copy or shoot engaging images. On the other hand, there are other products that lend themselves well to copy that people really want to read. Stoo Studio sells carefully crafted, upscale sheepskins. Head over to their About page, and you’ll find copy that’s as memorable as the picture above, which comes from the company’s homepage. The About page tells the story of the company’s founders and the painstaking steps they go through with each sheepskin, including eco-friendly measures and a finishing touch that makes it incredibly soft. The Stoo Studio About page instantly creates a connection with viewers by telling a detailed story about the company’s founders and how much care they put into what they do. 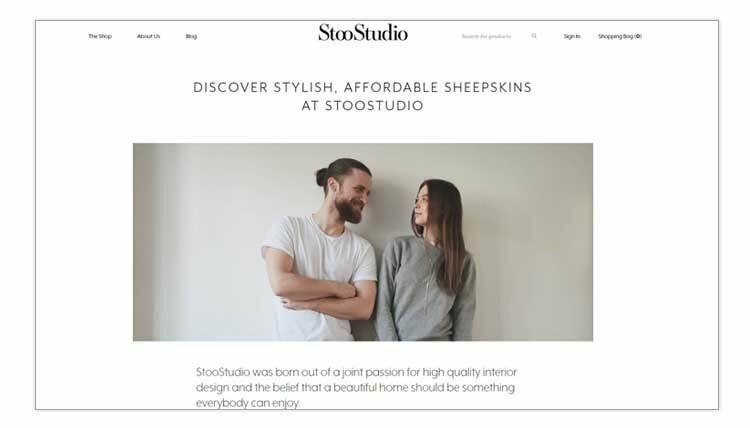 It’s understandable why, if people were shopping for sheepskins, the ones offered by Stoo Studio would be on their shortlists. When content comes across to viewers in an approachable tone, it resonates in ways that go beyond the words on the page. 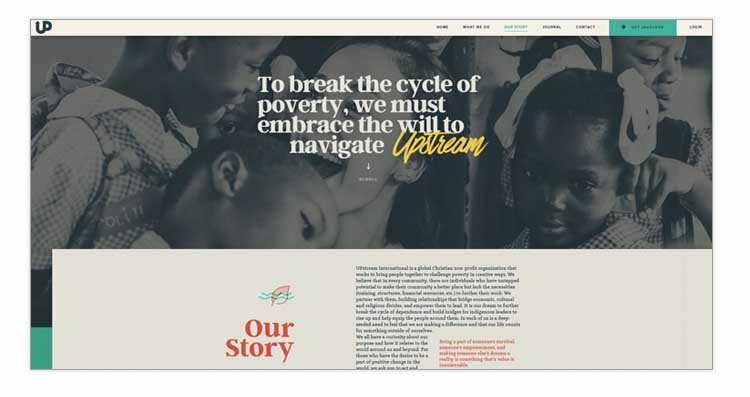 Take a look at the page below, created for a charity called Upstream. The website urges people to sponsor children who have been through hard times, reminding them that, despite what they’ve been through, a better future is possible. On the nonprofit’s About page, you can read about the founders, Joe and Sami Rigelsky. Learn how Joe’s Christian faith has impacted his life, how he loves to fish, hunt and snowboard and has a particular fondness for butter pecan ice cream. You’ll also read about how Sami likes Skittles that have been naturally softened by the Haitian sun. Although using a professional tone on your About page is usually a good move, work hard to make sure the words don’t come across so stiffly they fail to move readers. As you’ll see on Upstream’s About page, the organization does a good job of describing the founders in relatable ways. The internet is full of companies that sound amazing, but what’s on the page just doesn’t add up. To avoid the possible negative perception that your business is one of them, build your About page so it includes things that tell potential customers you are as good as claimed. Testimonials and mentions of accolades won are great things to feature, as well as content about the people who work for the company or the products sold. The first is a snapshot of a smiling, youthful team, and the text above the photo mentions how the employees collectively offer more than 60 years of experience. The second image is from the company’s timeline. 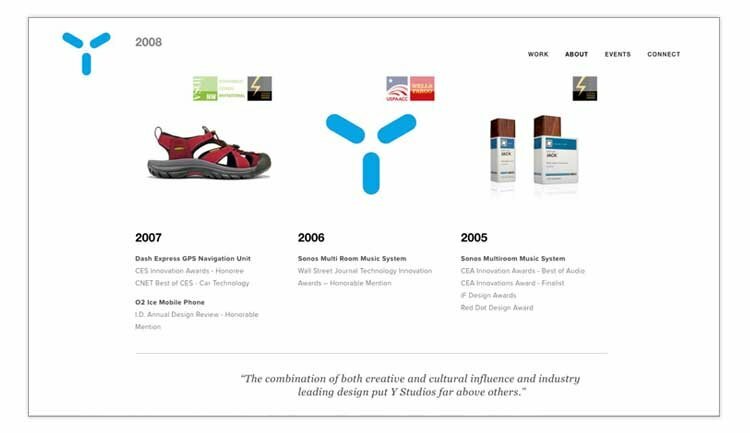 It reveals some of the brands Y Studios has worked with and includes customer testimonials seamlessly embedded in the page’s content. Alternatively, look at the way Storq, a website that sells mix-and-match maternity wardrobe pieces, assures customers the clothes really look great. While browsing the About page, you’ll see an image of a fashion-forward, trendy expectant mother surrounded by bullet points that mention things people can look forward to if they purchase Storq clothes. People notice the model looks fantastic and can then read the accompanying information to find out details about the garments. For starters, the clothes have as few seams as possible for maximum comfort, are adaptable for different seasons and include screen-printed care instructions instead of itchy tags. The three samples above offer various examples of About pages that inspire customer confidence and make individuals feel like they’re making a good choice by doing business with the company. As you craft content for your business’s About page, think about ways you could show off your strong points to attract new customers. On the same note, here is a guide to better E-Commerce about pages. 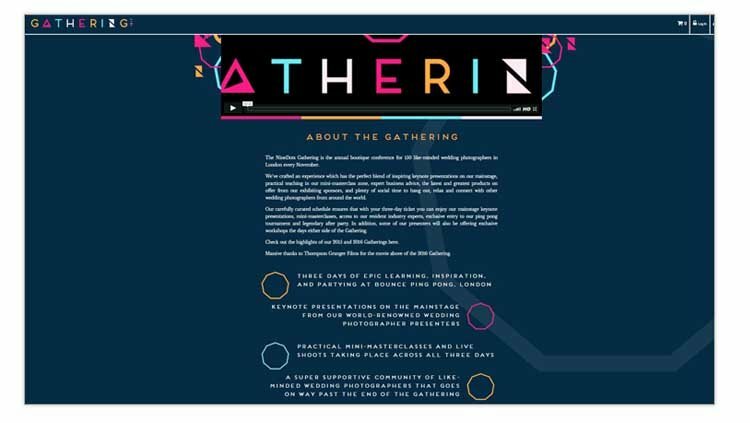 The About page for the conference includes a link where people can read about what happened at the event during past years, which is an ideal way to entice individuals who are still on the fence about attending. Also, the About page’s footer includes links to do things like peruse the schedule or learn about the presenters. 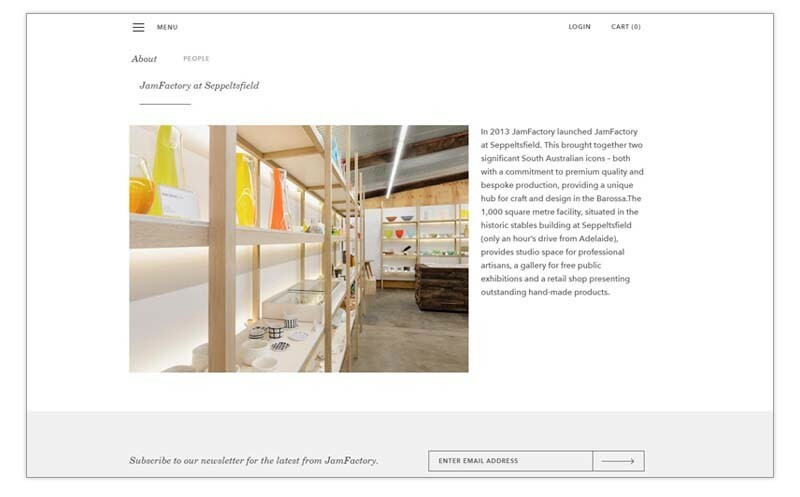 The designers successfully incorporated related links into the content without taking attention away from the page itself. If you can do that while building an About page, the likelihood increases that customers will linger on your website and get deeper into the content. Eventually, the things they learn could earn their loyalty. Your About page should have something that allows you to track how many people are responding to calls to action or otherwise making positive moves after being prodded. One of the ways you could do that is include a box on your About page for people to enter their email addresses and sign up for your mailing list. The About page for JamFactory includes some of the notable elements already discussed, such as beautiful images and engaging content. Because it has a mailing list sign-up box, it’s easy for the sites’ managers to track how effective the About page is by measuring the number of people who enter their email addresses. That’s not the only indicator of an About page’s effectiveness, but it’s something worthy to keep in mind. Now that you’ve learned some components of a great About page, you should feel well-equipped to build one that fits your company’s goals and gets people excited about what you do. The creation process might take a while, but hard work pays off. It is a most important topic for all who has its own website. Mostly persons are confused that what information, they should present on about us page. You have explained it very briefly. These are fantastic and I’ll certainly be showing these examples to clients to give them inspiration. Thanks for posting.